We took a Luna photo booth along to the Desert Shootout - a workshop for photographers held in the Californian desert, to add to the fun and to see what professional photographers thought about our newest photo booth model. It's an exciting time for TapSnap, this fall we've launched the new TapSnap Luna, and we couldn't be more excited to share it with the world! The new Luna includes the features we love about our other photo booths (such as high quality photos, and ease of sharing on social media), but it also features some new and improved highlights such as the lightweight portability, advanced lighting . options, stunning design, and a battery life that will be the envy of even the most popular Smartphones. We've elevated the classic photo booth to a level that we didn't dare to imagine was possible. Proud of our best product yet, we thought we would share our latest photo booth model with our biggest competition in the event industry: real human photographers. We couldn't have hoped for a better reception. The clean retro design of the Luna was a big focus for this model, so it was great to have photographers report that the Luna photo booth was "very aesthetically pleasing". Photographers know events, and when you've been in the game as long as these guys, you're going to know what your clients want and what works for an event. Feedback from this group of professionals was extremely positive, and the photographers were especially impressed with our social media sharing capabilities. The photographers had a great time playing around with the photo booth, and owing to the new improved battery life, they were able to enjoy it without wires for over 4 hours. The built-in flashcard and DSLR camera meant that their photo booth photos were of the same high quality as photos taken with their professional cameras. We were delighted that our Luna was such a hit with experts in the event industry. TapSnap photo booths are part of over 10,000 events per year. 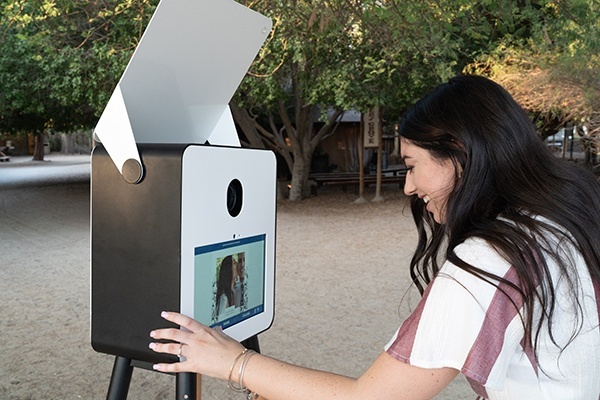 The increased portability owing to the lightweight frame, and the 5-minute set up and take down time will be a massive asset for Luna photo booth owners - especially during the upcoming busy holiday season. and I love the fact that it doesn't need to be plugged in..."
Overall, we are thrilled with the positive feedback that we received from the photographers who participated in the Desert Shootout. We can't wait to see what kind of events and adventures Luna owners will have in the future, and are confident that our photo booth will provide owners with the best product in the industry.